This NEW Mossy blended synthetic thread is the same thread we use in our kits, and our Light weight Ghillie suits. Our Mossy jacket and Pants set is made with this same thread. 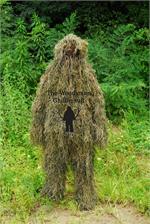 Pre-blended to save you time if your building a Mossy ghillie suit, Blanket, Rifle wrap, or adding to your current suit. Sold by the one half pound.